The Forward Music Project, spearheaded by cellist Amanda Gookin, is driven by social justice for women. We musicians, now more than ever, have an incredible ability to effect change in our communities. 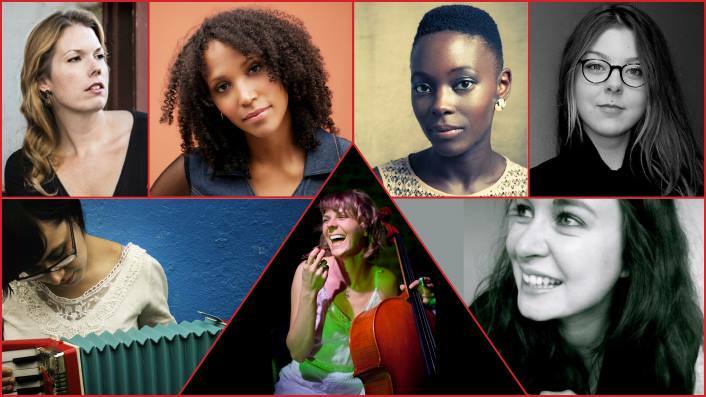 Six female composers, including Nathalie Joachim, were commissioned to write a piece based on their personal story or a women’s issue they wish to highlight. The pieces are stylistically contrasting and represent the vast definition of what it means to be a woman. The themes of these pieces range from empowerment and issues of the LGBTQ+ community, to reproductive rights, and violence against women. + To continue to raise awareness of women’s issues. + To contribute to the evolving future of new music. + To gain support for organizations focusing on women’s rights. + To support the work of living composers of all backgrounds. + To discover better ways to connect a community through art. + To empower young women and provide them a platform of strength and courage to speak up and speak out. + To encourage change in the arts community in New York and throughout the country. These commissions serve as a catalyst for education and outreach activities. Beyond writing the commissions, the composers and Amanda Gookin will run educational workshops for young women to encourage them to speak up and speak out through the original creation of poetry, music, theater, and dance inspired by talk circles surrounding issues young women in the U.S. and around the world are facing today. In addition to traditional concert settings, Gookin will give free performances and talks at a women’s shelter in Brooklyn, a Planned Parenthood location, and an after-school girls organization in Manhattan. Visit the calendar for upcoming scheduled events.